With the kids back in school it has thrown our house in a tizzy, all of us are trying to get everything done in time before bedtime comes and it seems like we are all forgetting something. This weekend I sat down and came up with a new plan of attack, our new Chore Chart & Household Currency System. It is includes the same things the kids were responsible for but changed up a bit. Summer time I am more lenient in general, they have more electronic time, more phone time, less must dos around the house (because there is less to get done all the time) and things do not need to be on a tight schedule. Now we are back in school and the tight schedule, less electronic time and more things to get done is back and I would like as little fighting as possible from them and as little forgetting who didn’t do things as I can. The Chore Chart & Household Currency System makes it so when they want to do something they have to “pay for it” and they can not “pay for it” if they have not earned the money. To earn the money to “pay for it” they have to do their responsibilities and they can earn more money for chores above their normal must dos. There are 3 different parts to this Chore Chart & Household Currency System Printable set. You can print each one out as many times as you need to. Just click the link and then print it or you can download the printable to your computer and open it up in excel if you need to add, remove or customize the job list and the pay amounts. 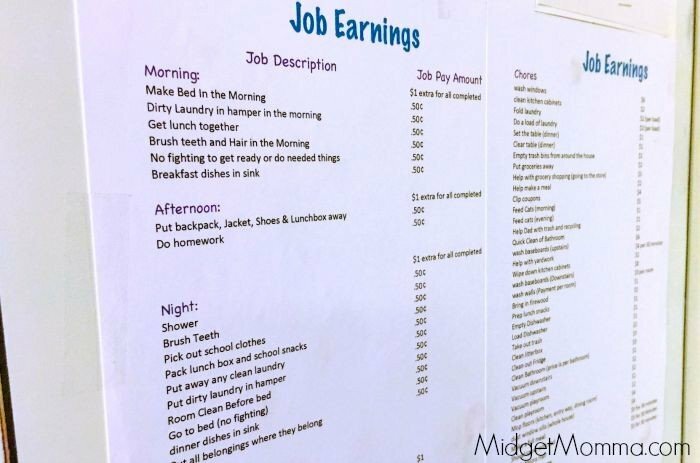 The first set to the Chore Chart & Household Currency System is the Job list. I have it broken down into two sections. To set this up, I used a piece of poster board and printed the job list and then glued it to the poster board. The first section of the Chore Chart & Household Currency System is the things they need to do daily. Things like, making their bed, brushing their teeth, putting laundry in the hamper ect and it is broken down into morning, afternoon and night, with things under weekend as well. These are things they are expected to do, they are the things they normally do anyway but now there is a Momma Buck Value to them. If they do everything like they are supposed to do on a day they earn $12.50. Which gives them the ability to have the 2 friend phone calls they like to, or have a little bit of electronic time if they want to after their homework is done. If they do them all then they get a $1 Momma Bucks bonus for each time of day. The second section of the Chore Chart & Household Currency System is the other chores in the household. Things like doing a load of laundry, vacuuming the downstairs, mopping the floors, helping with yardwork ect. These are valued at more then the ones they are expected to do. These are the things that I like them to help with and make things easier in the house. The second part of the Chore Chart & Household Currency System is the “Spending Money List” This is where everything they would spend their money is, and how much it costs. 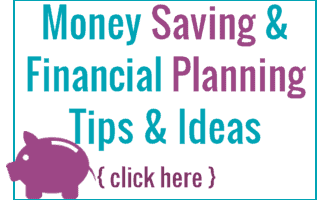 This is where I have listed rewards, behavior money loss and other expenses. 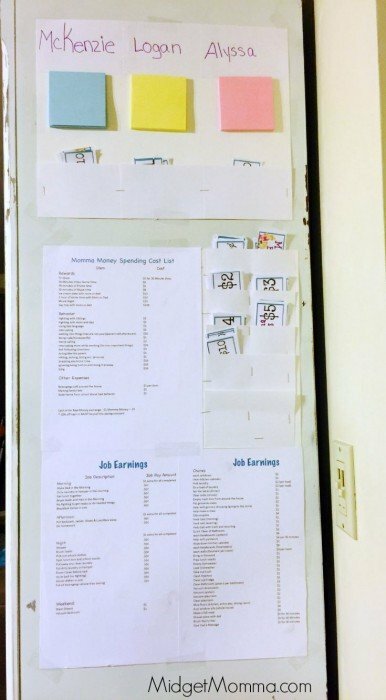 To set this up, I used a piece of poster board and printed the Spending list and then glued it to the poster board. On the other side of the poster board I used index cards and stapled them on it to be where I hold all of the Momma Bucks. The rewards section of the Chore Chart & Household Currency System includes things such as 30 minutes of phone time, movie time, video game time, 1 hour of time with mom and dad ect. Which on it I put $5 is 30 minutes of phone time, in order for them to earn $5 in Momma Bucks all they have to do is the expected things for the morning and afternoon, which includes homework. Granted they can skip doing their morning stuff and use money they already had but that will end them up going in to the negative eventually and being stuck having to do the things anyway. So they are still required to do what I expected of them before the new system, but now they need to “pay” to do things like movie night, tv show, video games ect and it will help them be more accountable for when the do and don’t do things. 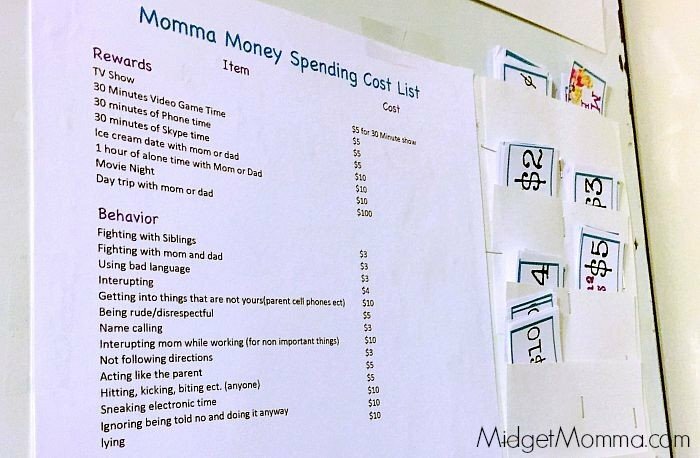 The Behavior section of the Chore Chart & Household Currency System they lose money for bad behavior. I have them priced pretty high, as we do not have many behavior issues in general (thankfully) however I want to stress the importance of things like not interrupting, not going into things that are not yours ect. The Extra Expenses section of the Chore Chart & Household Currency System. Things that are not bad behavior, or rewards but things like, if you leave your backpack on the floor instead of putting it away it will cost you $1 Momma Buck to get it back. The kids can also opt to turn their Momma Bucks into real cash if they want to. $1 in Momma Bucks = 25¢ in real cash. However I also made the stipulation that if they turn their Momma Bucks into cash then they have to put 10% of it into savings. If there are other things that you include in your budgeting that you want to teach your kids about (like tithing you can add that too). For now I am trying to get them to focus on savings vs spending all of their real cash by having them put 10% into savings when they want to cash out for real cash. The last section of the Chore Chart & Household Currency System is the tracker. Because I can lose my mind easily and forget each kid has their own color post it notes. I use these during the day to write down when they lose money. I don’t really have to worry about them forgetting when they earn money because kids do not forget when you owe them money! I wanted this section to be easily rotated, I didn’t want to be printing out a new spreadsheet all the time so I went with post it notes and index cards when making the Chore Chart & Household Currency System tracker. It is easy to add a new post it note pad to it. 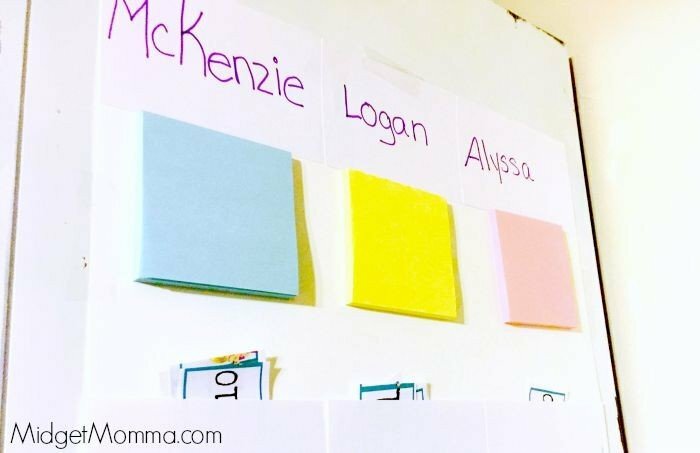 To make the Chore Chart & Household Currency System tracker section I used poster board and at the top stapled index cards and wrote their names under them. Then I used the post-it note pad and took the back off, it is stick already and placed it under the name card. Then i used another index card and stapled it on 3 sides and that is where we keep the money they have earned. When I pay them we put the money in their money pocket. This makes it so none of the kids can try and take money from the others and no ones loses their bucks. I used poster board because I wanted it to be more stable then just a piece of paper. First I printed the Job list and glued it to a piece of poster board. Then I printed the Spending list and glued it to a piece of paper. Using index cards make the money holder pockets. Only Staple these on 3 sides and then one staple in the middle so you can put the money in it. Then Put together the tracker. Print the Momma Bucks and cut them out and put the money in the money pockets. You can use a laminator to make it so they Momma Bucks last longer. Since I am not having the kids keep them and they are staying in the tracker I have not laminated mine. Putting all the parts together only took me about 10 minutes. Not bad at all! Now it might take you a little bit longer to set up your Chore Chart & Household Currency System if you are going to customize it. But its all set up in the excel download to keep the format and just change the things you need to. In order to do Extra chores all required daily chores must be done first. They can not go into debt because of spending. If they want to make a phone call and do not have the funds then they can do something to earn the funds before making their phone call. Mom holds the money in the tracker. This way no one can say someone took it, or they lost it and no one can take money from others. If you only do half of the chore then you do not get paid at all. If you go into debt because of behavior, debt will be paid off before you are given money to spend on other things. Current cash on hand can not be turned in for Momma Bucks. This is to make them think about how they want to spend the money they earn and learn how to budget. If you are having to pay because of behavior it will come out of money you are making not money you already have. This is because I do not want to take away from previous good behavior, I want the actions to have consequences for then not taking things away from the past. The Chore Chart & Household Currency System is not much different then the rules we had before, they had to have their stuff done before phone calls and electronics. With the Chore Chart & Household Currency System I can easily know who has done the things they need to so they can have rewards. Yes they can save them up or spend them when they want. Yes they can skip doing their morning stuff but then it will catch up to them when they run out of money. I wanted to make it so they were able to stay on track with what was needed to be done and no one forgot things like putting the lunch box in the freezer after they get home from school (they have packits) or someone didn’t put laundry in the hamper but needed their gym clothing washed. They can easily see the list to know what they need to do. My youngest is 5 and can not read yet but she is really good at remembering what she did. It also will teach them about budgeting and spending because they will have to choose wisely when they are spending their money. They have the option to spend it as soon as they get it or to save it for bigger things. 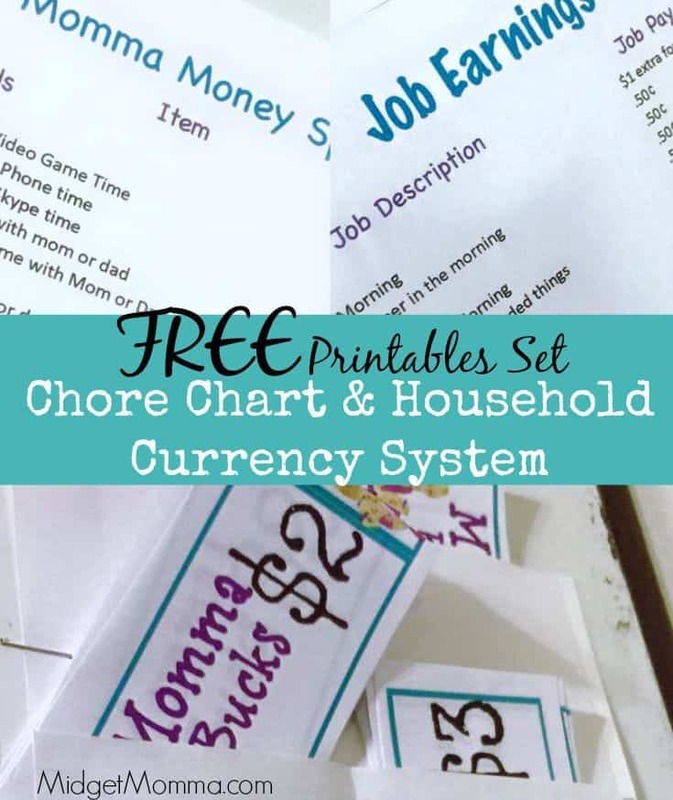 I hope that this Chore Chart & Household Currency System makes things in your house easier when it comes to kids doing chores, learning about spending, budgeting, responsibilities all at the same time. And what is great about the Chore Chart & Household Currency System is they don’t even realize that they are learning daily while using the Chore Chart & Household Currency System.